Two billion years ago, the Progenitors commenced the process of 'uplift': genetically engineering the more intelligent animals of many scores of worlds to sentience and intelligence. They in turn uplifted other races, and then others, in an unbroken chain that would eventually span aeons and no less than five galaxies. Each 'Patron' race would receive 100,000 years of indentured servitude from their client races before the clients would be allowed to uplift species of their own and become Patrons themselves. The Progenitors are long gone, as are many of the races they sired, but the process of uplift goes on. When a race is discovered in a tiny corner of one galaxy which has no Patrons and claims to have evolved naturally without outside intervention, it sends shockwaves through galactic society. The Solar system, 2246. Humanity has narrowly avoided being given to another Patron race to 'complete' their 'long-abandoned' uplifting. At the time they were discovered, humanity had already uplifted chimpanzees and dolphins to sentience, and were able to claim Patron status for themselves, to the fury of many, far older races. When a scientific mission is launched from Mercury to investigate lifeforms discovered living in the Sun's upper layers, several other alien races are furious with humanity's temerity: the Galactic Library states that life cannot exist in the atmosphere of stars, so their claims are clearly lies intended to bolster their own status. Jacob Demwa, an expert in uplift, is called in to help clarify the situation, but he finds several human and alien factions battling to control the information about the discovery for their own ends, and some of them may be willing to kill to achieve their ends. Sundiver (originally published in 1980) is the first novel in David Brin's acclaimed Uplift Saga, a space opera series running to six novels. The series has won two Hugos, two Locus awards and a Nebula for Best Novel, and is highly regarded in the SF canon. However, most of these plaudits are aimed at later books in the series (particularly the second and third volumes, Startide Rising and The Uplift War). Sundiver itself tends to get a little overlooked in the mix. 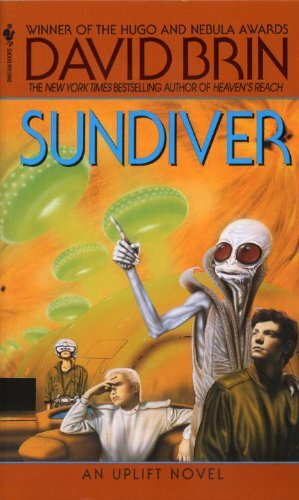 Sundiver is a totally stand-alone SF novel. It's set about 240 years before the other books and features no ongoing storylines or characters. Readers are in fact often encouraged to start with the superb second volume and disregard this one (there are also a few minor continuity issues between Sundiver and the other books), which is a bit of a shame. 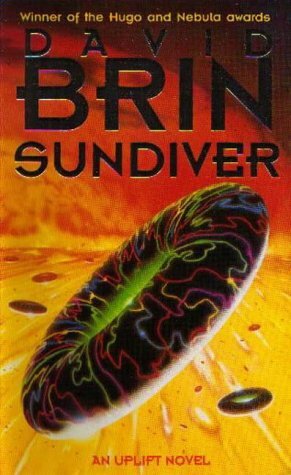 Though Sundiver is the weakest book in the series and the most forgettable, it's still a reasonably entertaining SF mystery novel. Our primary POV in the novel is the conflicted character of Jacob. Jacob is suffering severe PTSD after saving one of Earth's space elevators from destruction through various feats of derring-do, which has led to various mental problems that he has to deal with through conditioning. This makes for a highly unreliable narrator, who often pauses to wonder if his own psyche is undermining his efforts to solve the mystery. This introduces an element of uncertainty into the story which is effective at being unsettling and forcing the reader to re-examine everything that's going on. On the other hand, Brin isn't as good at doing this kind of thing as Gene Wolfe or Christopher Priest and eventually it turns out that the amount of misdirection going on is rather slight compared to the potential. Still, it's a nice idea. The mystery itself is at the centre of the book: what is going on with these newly-discovered lifeforms floating above the Sun? There are your usual assortment of false leads, red herrings, enemies turning out to be good guys and vice versa, but the reader is not given sufficient information to solve the mystery by themselves (always a slight problem with a mystery-based narrative). The mystery is solved through the application of scientific principles, which is quite enjoyable, but the way Jacob gathers everyone around to reveal the secrets in a scene straight out of Columbo is a little bit cheesy. Luckily, the characters other than Jacob are a colourful and interesting bunch (though the annoying journalist with the outrageous French accent borders on caricature), and Brin is already doing his signature trick of giving us really bizarre and 'different' aliens but also making them relatable as individual characters, something that will come out much more strongly in the later books. Sundiver (***½) is a reasonably solid SF mystery novel, though the solution is a little bit too neat and the story's full potential is not realised. The book's biggest problem is that its sequels are so vastly superior they tend to outshine it, which I suppose isn't the worst problem in the world to have. The book is available now in the UK and USA. I recently selected Startide Rising for my sci-fi book club to read and of the 12 or so people who usually attend, not a one liked it, and many actually couldn't finish it and didn't show up to the meeting. I can't say I disagreed -- though moderately interesting, I found the book terminally overlong, the POV structure needlessly fractured and cursed with too many characters, and the plot ultimately rather low stakes. A few members went on to read The Uplift War (I have no idea why, since they were mixed on SR) and reported it was only slightly better. I am actually more drawn to what I have read about Sundiver and might try it one of these days, since I have the entire first trilogy, but the second one, at least, was a huge disappointment for me. I've never read any of his work although I think I have a copy of KILN PEOPLE sitting around on a shelf somewhere.